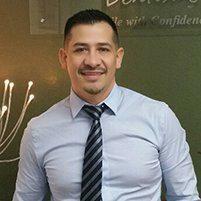 Dr. Zamora DDS welcomes new patients to his comfortable and modern office in the Mission District of San Francisco, CA. New patients will benefit from a thorough exam and cleaning services using advanced dental technologies. What Does a New Patient Exam Include? At your first visit with Dr. Zamora, you will receive a comprehensive dental examination. The doctor will take time to get to know you, asking questions about your medical and dental history and about any fears or concerns you might have regarding your dental care. He will check your head, neck, the joint of your jaw, and the salivary glands and lymph nodes in the neck area. He will also assess the soft tissues inside the mouth, checking that the tongue, lips and cheeks are in good health. Your periodontal, or gum, health will also be checked as well as the integrity of your teeth, including the bite. During the initial visit, Dr. Zamora may have x-rays and photos taken of your teeth so that any changes can be monitored and reviewed at future visits. According to the American Dental Association (ADA), adults and children should make at least two visits to the dentist each year. However, if anyone has any history of periodontal (gum) disease, they should visit the dentist for cleanings more often to prevent the recurrence of infections or disease. More frequent visits are also recommended for those who have conditions such as diabetes or heart disease, because they are shown to have strong links with dental problems. Also, anyone who uses tobacco products often should visit the dentist regularly, and should also stop the usage of tobacco. Tobacco use can permanently stain your teeth and cause other issues, including oral cancer. Will my dentist screen me for oral cancer during a routine check up? Oral cancer screening is a regular part of most dental exams. After the cleaning, which is usually performed by a dental hygienist, the dentist will assess teeth for signs of decay, maybe comparing your teeth to the x-rays or photos from a previous visit to mark any change. Dr. Zamora will examine your gums for signs of inflammation and disease along with your mouth and throat for any signs of oral cancer. While the Oral Cancer Foundation states that a count of one person dies of oral cancer once every hour in the United States, if found and treated early, oral cancer is highly curable. Your dentist checks the over all oral health and condition of your teeth and mouth during a check up.